'Lamina' is an element of the vertebral arch that gives attachment to the ligaments of the spine. It is also the flat part of a leaf as found in seaweed and other plants. Nuclear Lamina regulates cellular events such as DNA replication and cell division, and Basil Lamina (Lamina Densa) is an extracellular matrix discernible only with an electron microscope. 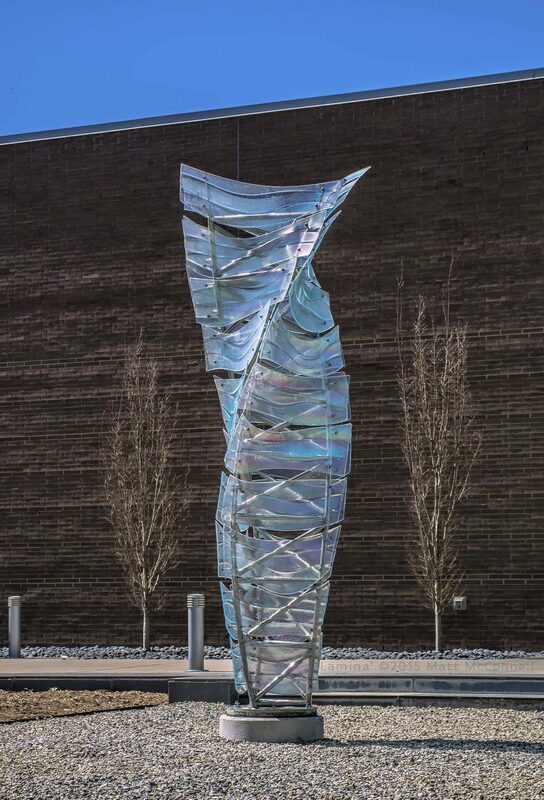 The piece is inspired by the technology, growth, and complexity of the Research Triangle, with imagery connected to biology, engineering, and mathematics, including marine plants and fossil forms. It is meant to imply both animal and plant form, with a colorful skin that changes in light and reveals the core structure within.